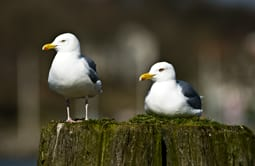 We provide a professional Gull Control Service in the Cardiff, Penarth, Barry area and dependent upon the level of problem will travel South Wales and the South West to assist in proofing and controlling for pest gulls. Herring gulls are large, noisy gulls. Found throughout the year around our coasts and further inland around rubbish tips, fields, large reservoirs and lakes, especially during winter. Adults have light grey backs, white under parts, and black wing tips with white ‘mirrors’. Their legs are pink, with webbed feet. They have heavy, slightly hooked bills marked with a red spot. Young birds are mottled brown. Loud wails and laughs or more plaintive mewing. They breed predominantly in colonies, on coastal sites around the UK, including cliffs with grassy slopes, shingle beaches, small islands and rooftops in seaside towns. They are also found breeding on the moors. Primarily coastal but more widespread in winter, ranging inland to feed on rubbish tips and roost on large lakes and reservoirs. During the winter months they are joined by birds from Scandinavia. They have suffered moderate declines over the past 25 years and over half of their UK breeding population is confined to fewer than ten sites.